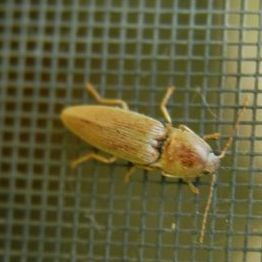 SIZE: Adult 1/2" - 1 1/4", larva 1/2" - 1 1/4"
IDENTIFICATION: Adults are long, slender beetles, usually dull brown or black with bands across the wing covers. 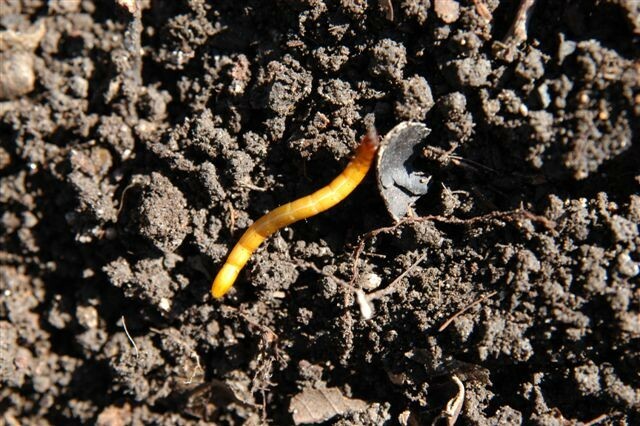 Larvae (wireworms) are yellow, orange, or brown cylindrical worms with shiny, hard skin. Eggs are laid in damp soil several inches beneath the surface. Adult beetles can flip in the air to right themselves after being turned on their backs. That's where the click comes from. BIOLOGY AND LIFECYCLE: Some species are only a problem in poorly drained soils. Some have a two-year life cycle while others require up to six years to complete a life cycle. Adults overwinter in the soil. HABITAT: Flowers, leaves, under bark, and in rotten wood. Vegetable gardens and agricultural crops, especially where soil doesn't drain well. FEEDING HABITS: Wireworms eat small grain seed and seedling roots. Will bore into large roots, stems, and tubers. Will attack beans, beets, carrots, corn, lettuce, onions, peas, and potatoes. Adults of many species don't feed; some eat plant foliage. ECONOMIC IMPORTANCE: Wireworms can severely damage crop production. They are especially hard on newly planted seeds and young root crops. NATURAL CONTROL: Stimulate beneficial soil life and improve drainage. Spiders, birds, toads, snakes, and beneficial nematodes. ORGANIC CONTROL: Till the soil and add compost, liquid biostimulants, or a mix of manure tea, molasses, and citrus oil. INSIGHT: False wireworms are different insects. They are the immature stages of the darkling beetle, a beneficial.